Arsenal’s Aaron Ramsey appears he won’t be leaving the Gunners during this transfer window as the club are hopeful of getting him to sign a new contract. 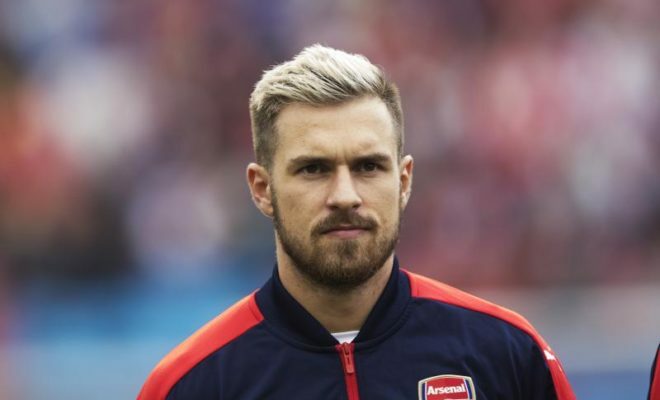 Recently, Ramsey was rumoured to be close in signing a new deal with Arsenal but with the possibility not seen then, but it now seems the gunners are not ready to let go of the 27-year old anytime soon. Reports from Football.London claims Arsenal are still holding talks for the midfielder’s contract extension and it ‘look certain’ Ramsey will remain at Emirates when the transfer deadline reaches by 5pm today. Meanwhile time seem to be against the Gunners in a bid to replace Ramsey, so it appears Arsenal wouldn’t be left with that much of a choice regardless of what the outcome of the contract negotiations will be. Although, if the Welshman finally decides to exit Emirates, it is hoped that he informs the club early enough to enable Coach Unai Emery find a replacement during the January’s transfer window. After the close of transfer window today, it is hoped Ramsey can now focus and prepare to get himself fit and ready to perform well for Arsenal as the Premier League season begins on Sunday.